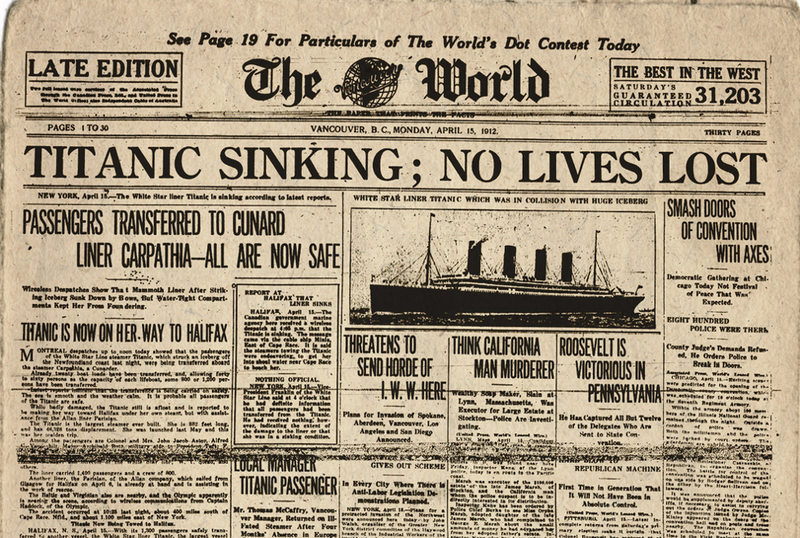 Whoa, did The World newspaper ever get it catastrophically wrong on the morning after the sinking of the Titanic. Shockingly, they weren't the only ones. These stunningly inaccurate newspaper scans were dug-up by Retronaut. Below are headlines from The World, The Vancouver Sun, and the Vancouver Daily Province. Many British papers got it wrong, including the Daily Mail (no surprise there). The New York Times got it right, though the official death toll reached 1,517. American newspapers had a six-hour publication advantage over their British counterparts, who rushed to get the papers printed. So why the inaccurate headlines? According to Christopher Sullivan, an editor at the Associated Press, there was a tremendous amount of confusion in the hours both during and after the sinking. Journalists were desperately trying to glean everything they could from various sources, including Marconi wireless receiving stations that were receiving distress calls from the Titanic and other signals from ships at sea. But during the course of all the ensuing wireless chatter, someone asked if all the passengers were safe. A subsequent message claimed that the ship was being towed to a harbour in Halifax and that the passengers were safe. Trouble is, those reports were referring to another ship, most likely the Carpathia.